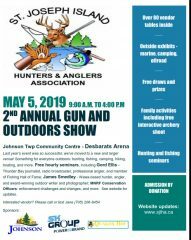 Johnson Township Recreation is pleased to announce that it is partnering with St. Joseph Island Anglers and Hunters to present their Second Annual Gun and Outdoors Show at the Johnson Township Community Centre in Desbarats on Sunday, May 5, from 9am to 4pm. Click on the image to download a poster. Entry is by Donation. Last year’s event on the Island was so successful, the Hunter’s and Anglers are moving to a larger venue – The JTCC! There will be something for everyone outdoors: hunting, fishing, camping, hiking, boating, and more. 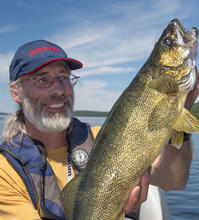 Free hourly seminars, including Gord Ellis -Thunder Bay journalist, radio broadcaster, professional angler, and member of Fishing Hall of Fame; James Smedley – Wawa-based hunter, angler, and award-winning outdoor writer and photographer; MNRF Conservation Officers: enforcement challenges and changes, and more. Click here to see the SJIHA website for updates.